USD Index has near kissed your upside target yet precious metals, commodities, and associated shares have pretty much held the line which on face values seems impressive. Could it be entirely down to the North Korea situation having skewed matters some? I’m confused, not sure. Comments appreciated if you have any. Ps. I see Rosen has come out with another round of hokum on your site. There’s definitely a smell of rank dead fish surrounding that alias methinks. Motive? I dunno! If you keep this fact in the back of your mind then you know that day to day girations in the markets or most of the stuff like North Korea, is mostly just noise. Stocks are trending inline with my expectations for an oscilation around the forecast trend. Gold silver, I don't track too closely (unless extremely overbought or oversold) as they are in a bull market, i.e. I have $2000 penciled in for gold. First of all, I would like to say thanks for your great analysis. As predicted, a volatile market this week with a low getting close to 10,976 and after hours trading just pushing over 11,200 yesterday. This morning, after hours is back down to under 11,100, but are we going to see another pull back to closer to 11,000 when the market opens? Also, it's the end of the month next week, so do you think it's likely to remain choppy into next week? Expectations were for a sideways to downtrend this week that risked breaking 10,976. The Dow is showing relative strength which suggests that the downside is limited, therefore probability favours the Dow remaining in the range 11,200 to 11,000 i.e. not much change from current 11,100. I will come back to this during the weekend and post a short comment. The eurozone debt concerns seem to be accelerating with the Bank of Portugal today warning of an unbearable financial sector as government bonds continue to rise. 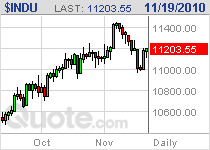 I just wondered what your thoughts are for the Dow for the remainder of this week? Has this changed anything regarding your expectations for December and a target of 12000+ in Jan?